Please let us apologize for the delayed announcement. The November Foxkeh wallpapers are now available. 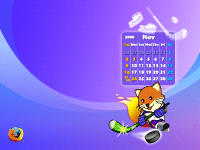 This month, the theme is ice hockey, which is a winter sport most popular in North America. As it is sometimes called a "martial art on ice" will Foxkeh be ok in this rough-and-tumble sport? Although Foxkeh is not wearing his helmet in this image, of course in a real game he would wear his helmet for safety. Also Foxkeh can use his flaming tail to block attacks, so he would be a formidable opponent. YAY!! Thank you! Foxkeh is sooo cute!! I think the September one is better, no offense. He is cute as usual >w<. However I'm using the September wallpaper now just because I modified my desktop theme to be green. Maybe I should try to modify the theme again so that it would be match with other background. How lovely! This will be my wallpaper the rest of November. Yes! Will he be ski jumping, or perhaps bobsledding next month? I can't wait! I wait the next month impatiently! OMG YES PLEASE MAKE PLUSH TOYS FOR FOXKEHHHHHHHH!!! Thanks so much for Foxkeh wallpapers! How do I get a Foxkeh plushie? LOL Japan...They so have the monopoly on cuteness ^_^...not to mention sushi. Does Foxkeh like sushi?? I love the theme. I love Foxkeh. One more thing. Cursors. Animated cute little fox cursors...I mean, if you guys are bored and all you could make some...pretty please?